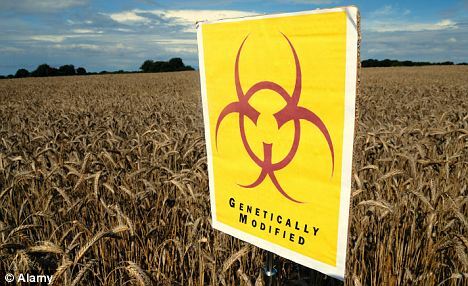 The same elite criminals that have intentionally caused famines and all kinds of disasters around the world (and the financial crisis) are now calling for GM food as the solution. All think-tanks belong to the elite financed propaganda machinery. We have the dirt-cheap technology to green the entire Sahara desert in almost no time. More on GM food at the end of the following elite propaganda article. The coming global food crisis has been artificially created, like the financial crisis. The cost of food will soar by 50 per cent over the next few decades as the world becomes racked by famine, mass migrations and riots, experts have warned. The increase will be triggered by the exploding world population, rising cost of fuel and increased competition for water, according to a leading Government think-tank. Spiralling food prices will push hundreds of millions of people into hunger, trigger mass migration and spark civil unrest, the report warned. And in the UK, the price of basics such as bread, rice and milk will spiral to inflation-busting record prices within the next few decades. The report, from Foresight, a think-tank set up to predict future crises, called for ‘urgent action’ to prevent food shortages, and said genetically modified crops may be needed to prevent famines. Even a ‘modest’ rise in food prices could push 100million people into hunger, the report warned. Global food prices are already at a record high. Last month the price of cereals, sugar and meat soared on the world’s markets after a series of crop failures caused by bad weather. Foresight predicted that the world’s population would rise from 6.9billion today to around 9billion by the middle of the century. As the world gets more crowded and more wealthy, demand for food, water and energy will soar. At the same time, climate change will increase the risk of droughts, floods and crop failures – creating a ‘perfect storm’ of food shortages and above-inflation rises in prices. Co-author Prof Charles Godfray of Oxford University said: ‘There is a very large risk of a quite substantial increase in prices over the next 30 or 40 years. The report, written by 40 scientists in 35 countries, calls for a ‘green revolution’ to boost production using traditional, organic and genetically modified crops – designed to be resistant to drought or salt water – and better training for farmers in less well-off countries. It also called for a massive crackdown on food waste. A typical British household wastes £500 to £700 a year on food that they buy and then throw away. Professor Sherman Robinson of Sussex University, one of the report’s authors, said food prices could go up by 50 per cent over the next few decades. ‘The robust conclusion is that the long run decline in food prices is over,’ he said. Professor John Beddington, the Government’s chief scientific adviser, said the food system was failing. ‘Firstly it is unsustainable, with resources being used faster than they can be naturally replenished,’ he said.